I would like to win the AccuQuilt Go! to make a quilt with. My 3 favorite dies are Funky Flowers, Go Critters and Go Alpha Baby. I would make a really cute baby quilt with these. Thanks for the opportunity to win! I would love to win a GO cutter cos I want an applecore, a double wedding ring and a tumbler die cos if you noticed the dies are mostly curvy and I do not want to hand cut them!! I want a Go1 cutter because I love to make clothes for my little girls, but I am horrible at cutting applique. I would start out my collection with the arabesque#3, baby abc, and critter designs. I would love to win the Go!cutter because I love speed and accuracy. The Go! would be PERFECT. I would love the 2 1/2 inch strip, the 4 1/2 inch strip, and the 6 1/2 inch square. What a great giveaway!! I would love to have a Go Cutter because of the accuracy and time saving qualities it has. Much better than I can do myself. I would like to have the half-square triangle, the hexagon and the apple core dies.Thanks for the opportunity. I would like the AccuQuilt GO Cutter in order to finish quilt prep work faster and get to piecing! The three dies I like are the chisel, 5" square and the tumbler block. Thank you!! Why do I want it? So I can stop pulling and teasing my badly cut pieces into shape as I sew them and try to make my corners meet. Hi Julie, I would like the Go! Cutter because although I actually like cutting fabric this would make it so much more accurate as well as fast. The dies I would choose are the large rag quilt, the tumbler and the 6.5in. triangles. What a GREAT giveaway! I'd really like to win this because I have an 80-something year old friend who has been mentoring me in quilting. She really wants me to start doing appliques with her. I'd love to use this cutter with her as I think she would find it amazing! I'd probably choose the GO! Alpha Baby and the GO! Circles but I doubt I would stop at just those. I'd have to buy lots more! I want an Accuquilt Go cutter because I cannot use a rotary cutter without cutting my hand or fingers at least once per quilt. Narrowing it down to three dies would be hard! But I would pick the 2.5" strip, the 6.5" square and the hexagons. I would love a cutter as I get rsi when I use rotary cutters too much and this could save a whole lot of work! Dies: 2" square, 2 1/4" strip and 1 1/4" strip would be amazing. I would like the Accuquilt Go because it would give me the courage to try patterns that are outside my comfort zone. The 3 dies I would really like to have are drunkards path (3 1/2"), apple core (6 1/4"), and hexagon. I like the Go! cutter because you can cut so many appliqué pieces in a short amount of time and they are all the same. I love the Fall Medley, Holiday Medley and Overall Sam. i love the convienience of the go cutter. i love the geometry and applique dies, the hexagon, circle, and bountiful baskets look nice. I would absolutely love to win this cutter!! I'm currently a stay-at-home mom so since my family is a one income family, as with a lot of families, I can't afford to buy one....Everytime I see a contest for a cutter, I enter it, every single time....The three dies I would like are the hexagons, circles, and (thanks to you and your fab tutorial) the drunkard's path 7".....your tutorial showed it to be so less intimidating!! I would love this beautiful machine to allow me to get the quilts done I want to do for Christmas. Cutting fabric is not exactly my favorite part of sewing! I would definitely get the studio tumbler block #3 and the drunkards path with either a holiday set or some circles. Well I would love a GO because I LOVE gadgets, can't afford one, and I think it would be awesome. I would love to win - I would love to speed up the cutting process so I can sew more. I want one because of all the reviews talking about how quickly it makes your cutting go! I'll admit cutting is my least favorite part of quilting and often times my desire to be finished results in less than perfect cuts. Of the dies I definitely want the blazing star die, the parallelagram die, and the circle die since I think I would use all of those A LOT!! Thanks for the chance for such an amazing giveaway!! I want the AccuQuilt to make my life easier when making quilts. I like sewing small pieces but not cutting them out. I like the Heart Set 2",3", & 4", the triangle isosceles 5" x 6", and the Arabesque #2. And after watching your video on sewing the circle cuts together, I want that presser foot! Wow, that was impressive. I always worry about whether I'm cutting my fabric crooked or straight, so the Accuquilt would solve that problem for me! My 3 choice dies: 2.5in strip cutter, 5in square, tumbler. This giveaway is even more awesome with the additional fabric! I would love to win a Go cutter to help me cut my stash up in strips for all those beautifuljellie roll patterns. I like to make fast quilts and are always on the go. The 3 dies are 2.5" strips, Tumbler and Drunkard's Path. Thank you so much for a chance to enter. It seems there are quite a few of us who don't like cutting! I don't mind cutting a few pieces, but when you get hundreds and hundreds it's tedious. I would choose the Go Circles (circles never come out perfect when I cut them out), the large Drunkard's Path and the 3 1/2 inch square. Thanks for the chance to win! I'd love to win because I want a fast way to cut my quilts! I'd like the hexagons, dresden plates and double wedding ring dies. I'd like the cutter, primarily to cut unusual or circular shapes to machine piece. I never seem to be able to get the precision well enough with a template and rotary cutter when I have to move or turn the fabric. With that in mind I'd love the Hexagon, Circle and Apple Core. Thanks for the complete and frank review! I'd like the cutter so that I could use it to cut curve shapes accurately and consistently. Plus it looks like a fun toy to share with my quilting buds. My choices: Drunkard's Path 7", Winding Ways, and Circles. You know why I would like the Go!Cutter? Because the one thing about quilting that I cant stand is cutting out the fabric. I dread it! Having the cutter would make every soooo much faster. The 3 dies I would use the most are the hexagon, 4" half square triangle and I saw a 2.25" strip die (how awesome is that?!?!). I have a newborn so this would help me on the time. I love the rose of Sharon,go star and the five inch square. I would love to wind a cutter because I always seem to mess up cutting with the ruler (darn slippage). Also, there are so many patterns out there that I have been hesitant to try because the start up seems so difficult. If I won, I would like to have the drunkard's path (7in), hexagon, and circle dies. I think I could use my regular ruler for most of the other ones. I'm a new quilter and have seen this cutter in action at my not-so-local quilt shop. I loved it. Alas, its not in the budget, but to win this would be a God send. I am amzed at all it can actually do. The Rag dies are crazy! Love them...it would same my hands and hours of cutting. The Apple Core and Dresden Plate dies are....wait for it....To Die For! Hi, I think the cutter would be nice because then I could cut things without worrying about leaving my rotary cutter out near the kids. I would choose the hexagon, drunkards path and tumbler dies. thanks for the chance! I would like a GO! cutter to speed up the process of preparing my quilts for piecing. I also tend to make little mistakes while cutting that make piecing more difficult so I'm hoping the accuracy of the GO! would eliminate this problem. If I won a GO! I would like the 2.5" strip die, the 7" drunkard's path, and the funky flowers die. Thanks for the review and chance to win! Now what quilter would not want one of these! Of course I want one to insure accurate cutting. I like the alphabet, arabesque, and feather dies. I want to win the AccuQuilt because I have 3 small kids at home & the time I have to quilt is precious. I'd love to have something like this that would save me time when quilting. The 3 dies I would choose are the strip cutter 2 1/2", the fall medley applique & the 5" square. I would love to have an AccuQuilt to cut perfect curves! I would get the double wedding ring 2-die set and the apple core. I'll throw in another since my first was a twofer — the rob peter to pay paul set. I would love to have this cutter because cutting out a quilt is definitely my least favorite part of quilting - and it looks like it would make that part so much faster! I'd love the apple core die, the alpha baby, and the sunbonnet sue. Thanks for the chance to win! i'd love to win this because i want ot see what all the fuss is about! i would love to do a drnkyards path ( ha! drunkd when i typed that!) but the thought of cutting them out stops me in my tracks. so i'd love both size drunkards path dies and the double wedding ring set - another quilt i am not brave enough to try! I want a GO! to make it easier to cut curved shapes. I tend to make quilts with shapes that are easy to cut with a rotary cutter and a ruler. Of course, I also like to do applique. So I'd like the circle, drunkard's path and fall medley dies. Thanks for the chance to win one of these! I would like a AccuQuilt Go! cutter to make table runners, pillows and quilts. It would make the cutting of the appliques so much faster. I would love to cut circles, and squares with this....they would be so accurate! Circle, square and 2 1/2 strip dies for me. The 3 dies I love are the 2 1/2" strip cutter, the circles, and the 5" square. With 3 babies under the age of 2, its hard to have my rotary cutter out when they are around. Having the AccuQuilt Go! Cutter would be great and so much safer for my house! i'm really very terrible at cutting fabrics, it's most definitely the most dreaded and least enjoyable part of the whole quilting process for me. i also have a small sewing table which is also my cutting table, and a tiny 18"x12" cutting mat, i'm usually fumbling over folds of fabric to try to get it all fit on the mat, and the results are usually not ideal. so you see, a GO! cutter will be much much MUCH appreciated in my house =) as for the 3 dies that i'd like to get, they would be Drunkard's Path-7" Finished, Strip Cutter-2 1/2" , and Quarter Square-4" Finished Triangle. thanks for the giveaway! I feel like this would be a spring board to my creativity as I find the cutting the most unsatisfying task. I would love the Drunkard's path, 2 1/4" strip and Dresden plate. The cutter would be amazing because I consider cutting my enemy. Cutting my fabric usually holds me back from making new quilts. I currently have three sets of fabric sitting, waiting to be cut, because I hate it! The three dies I would love would be the hexies, the tumblers, and the 2 1/2" strip die. I would love to have the AccuQuilt - it would speed up my cutting and make it ACCURATE so that one block isn't half and inch longer than the others :( I would love to have the 2 1/2 inch strip cutter (money saved instead of buying jelly rolls), the double wedding ring (pre-order!) and the set of 2,3 and 5 inch hexagons (wow!!!) Thanks for the chance to win! Why I want an AccuQuilt GO! cutter? The dies I would choose? Blazing Star, 2.5" Strip and one of the Half Square Triangle. I want the AccuQuilt GO! because it makes cutting easier, more accurate, and quicker. There may be other advantages, but until I get a GO! I won't know what they are. The three dies I like are bountiful baskets, the 2.5 strip and the 1/5 strip. I love basket quilts, and I love the log cabin block. Thank you for keeping this simple. I want to speed up my cutting so I can get down to the sewing. I really need to tame my scraps and I think this would help me do that. The 5" squares, the 2.5" strips and the Drunkard's Path dies would be my choices. Thanks for the great giveaway! I would love this cutter to save some time, of course. I have 5 children, 9 and under and would love the circle dies and a couple of the strip dies. Maybe the 1.5 inch and the 2.5 inch. That would just make my day, week, month! I would love to have a GO cutter because I love making quilts, and the cutting is getting a little difficult for my old hands. Also 2 of the quilts I want to make now have dies, and would make the projects so much easier - Sunbonnet Sue and Apple Core. Needless to say, these are 2 of the dies I want and the third one is the 2 1/2" strip cutter. Alright so why I (need) "want" the AccuQuilt go cutter. Because after seeing that great quilt you made with the drunkard's path I want to make that, but don't think I would ever cut all those by hand. Also I would make even more charity quilts, if I took less time cutting and that left more time for sewing. Would the the 2 1/2 die for binding, the hexies die to fee my addiction even more and of course the drunkard's path die. So crossing my fingers, toes, legs, arms and eyes!!! I would LOVE to win an Accuquilt GO! system because it would make the hard curvy cutting go SO much quicker. Plus, I saw the cutest skirt made with the tumbler! Anyway, I think I would choose the drunkard's path, the tumbler, and the hexagons. I would love to win because cutting out the pieces of a quilt is my absolute MOST HATED part of the quilting process. This machine looks like it would make it so fast and easy! I'd love the drunkard's path die, rob peter to pay paul, and circle dies!!! Can you tell I really hate cutting curves? I have just recently start quilting and the cutting out is my worst enemy! I can never get the cuts straight no matter what I do! I would not be able to live without the Go critter die...the go circle..and the go square 5"
I'd love to win because I really don't like cutting - I procrastinate about it for ages. I never seem to be very accurate either, no matter how hard I try! AND - eep! - these things cost a *fortune* in this part of the world! Dies...hmmm, tricky choice - but I would go with the 5" square because I use that such a lot for half square triangles, the Drunkard's Path, and maybe the 2" inch square as well (or the tumbler...or maybe the hexagons). Thanks! I would love a Go! cutter for a couple of reasons. First because cutting (well, and ironing) is my least favorite part of quilting. And because I would really love to try some patterns that I have avoided because of curved cutting and piecing. I would love the drunkard's path die, the circle die, and the dresden plate die. Oh...and now that you posted that video tutorial, I totally have my eye on the sewing machine foot, too! i sure would like to get my sharp instruments up and out of the way for long periods of time...little fingers make me worried! little fingers attached to kids getting taller and more curious!! id love the drunkards path, a hexagon and chisel...those are my 3 picks for today anyway!! Oh thank you so much for the chance to enter. If I was lucky enough to win one I would choose the following die- Sunbonnet Sue,Wedding Ring and of course the Dresden Plate. I would so enjoy doing classic design quilts so much quicker with the AccuQuilt Go Cutter. I would never be able to afford one,here in Australia they are quite espensive so winning would certainly be a big thing for me.Quillting that is quicker has to be a good thing. What an amazing giveaway! I would love to win the Accu Quilt, because cutting fabric is the part of quilting I most dread. I have fibromyalgia and it can take weeks to get the fabric cut for even a small quilt. If I could be the lucky winner, I would choose the 7" finished Drunkard's Path, the 5" square, and the 2 1/2" strip cutter dies. I would love to win an Accuquilt Go! because i ahve tried the Studio version at a local quilt shop and it rocked! I cut out enough tumblars for 5 quilts in about an hour! And the accuracy of the finished quilt was waaaaay better than my usual efforts! I would love the circle dies, the double wedding ring, and the hexagons please!! I would make my first rag quilt with the Go cutter because it cuts the little fringes and have always wanted to make one but never wanted to cut all those out. The three dies that I would choose: the 2 1/2" strip cutter, the 8 1/2" rag die and the 6 1/2" square. I would love to win the AccuQuilt GO! cutter, because the part of quilting I like the least is cutting the fabric. I would get it for my Mom to help her cut out quilts and maybe she could cut some for me! I'd get the tumbler, 6 1/2 triangles, and 5" square. Then I would be able to buy her more dies for birthday and Christmas gifts and that would make my life even easier! I would love a cutter because rotary cutting is not my favorite part of the quilting process (so I'm not very good at it). I would love to have the 2-1/2 strip cutter, the 7" drunkards path and the fall applique medley. Thanks for the giveaway! I would like the Drunkard's Path, Rob Peter to Pay Paul and either the Double Wedding Ring or the Dresden Plates. All of the Classic Shapes are just Great! I would love to win the Go because my 14 year old granddaughter has just started to enjoy helping me make quilts. She made some rag quilts for some of her friends last year and she got hooked. I would of course like to have the rag quilt die. 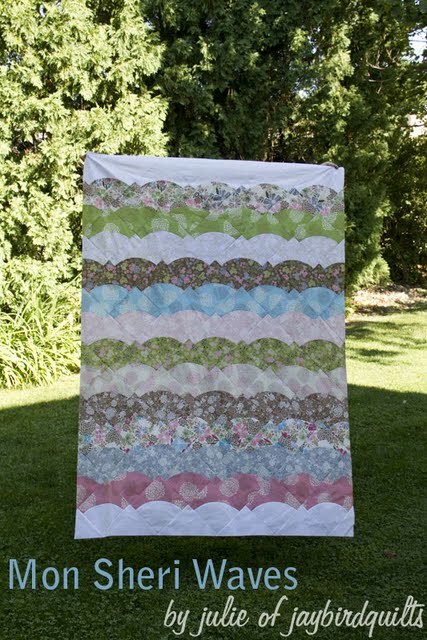 For myself I would like to have the 2 1/2 strip die....I love jelly roll quilts. Also the hexagon die.. I love grandmothers garden quilts. Thank you for the chance to win a Go. I would love to own a Go Cutter. From years of working on a keyboard and other things my hands are not what they used to be. I can only use the rotary cutter for a short length of time before I have to take a break because of my wrists beginning to hurt. This machine would also allow more accurate cutting because one of my biggest problems is not getting accurate cuts that then lead to inaccurate peicing. What a great opportunity and awesome review! I would love a GO! cutter to continue making quilts for my Hospice patients as well as those receiving treatment (and i can't forget my little man who is 6 months old!). It would be a huge time saver! I would like the 2 1/2" strip die, 5" square die and 6 1/2" square die. Thank you again and keep up the great blog! I would love to have the Go becuase I want to improve my applique - however I am horrible at cutting out the shapes. I think the Go would help me with that. The 3 dies would be Drunkard's Path, Hexagons and Funky Flowers. I would love to win an Accuquilt Go! cutter because I desperately want to get some quilts made, but have very little free time because I am caring for my Father who suffers from Alzheimer's Disease. I would love the Winding Ways die (have a friend with a 50th b'day coming up -- have all the fabrics, but haven't even starting cutting (much less sewing! ), double wedding ring die (have always wanted to make one of these) and the hexagons die. Thanks for demoing the Accuquilt and for showing us the Curve Master presser foot (was that the name -- must look back because I want one of those, too?!)!!! I would love to have a GO! cutter. It would help my precision so much ...I try to cut things well but sometimes the ruler moves and I'm off a bit. I also would have much more time to sew and create since the GO! cutter is such a time saver. 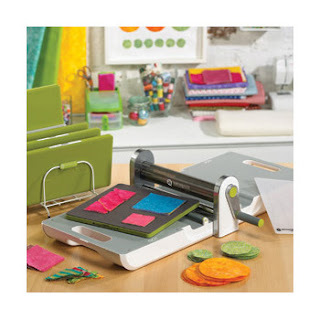 I would love to win this cutter because I hate the cutting part of making a quilt. The 3 dies i would select are the 5" square, the circle and the 2.5 strip. I want a GO cutter to allow me to cut quicker and more accurately. I would use it to get my scraps under control. I would like the drunkards path, hexagon and chisel dies. I would love the three die: Winding Ways, Double Wedding Ring, and the apple core. Why? Because I have limited time to quilt with three small children, and therefore more detailed quilts (suc as with curves) frequently are put on the back burner because I don't have the time and attention available to cut the pieces. This would make it so much easier! hmm... why would I like to win the cutter.... Well, because I want one! I know that there are lots of people who have really valid reasons why they deserve one, but I'll be up front, I WANT one! It would undoubtably make me a more accurate quilter, and the speed of cutting things out would help too. I would want the winding ways die, the 2.5 inch strip die, and umm.. the feathers die! I've always wanted to try a drunkard's path quilt but the cutting and sewing always intimidated. The dies + curved sewing foot makes them seem possible. I'd therefore get the drunkard's path die, one of the triangle ones, and the arabesque applique die. I want the Go Cutter because I think it will help me try shapes that I normally wouldn't-Drunkard's Path-and make things easier-Hexagons. I would love to win a GO since there are some patterns I would love to work on, but the cutting is something I am afraid to do. Having the GO would make it so much easier to use those patterns. Why would I like one? Well, with a 2 year old my sewing time is very limited, so anything to help save some time is a dream come true! I would love to have the AccuQuilt Go! for the ease of cutting accurate cuts. I have been quilting for a year now and still have a tendency to mess up when cutting and I think this would help me save fabric and time. The die cuts I would love to have are the: Hexagon (because I am looking forward to making a quilt with hexagons, but not excited about the cutting), the Tumbler (for the same reason), and Rob Petter to Pay Paul (I love the look of that pattern and would also like to make a quilt using it). I would love to win a Go cutter. I am going to make my daughter and her fiancee a double wedding quilt so that would be my first die. The next one would be funky flowers because they look so fun and lastly the drunkards path just because I like it. I would like the cutter to help me make more quilts that I think up but might be intimidated to try to sew otherwise. My three favorite dies are the Rob Peter to Pay Paul set, the Dresden Plate set, and the Winding Ways set. Thanks for hosting this give-away! This would work so well with the rugs I crochet-depending on the strip die and how it works. My husband has been out of work over 2 years and so my fabric is getting down to the unusual stuff and this would make cutting so much easier and faster. I like the classic, rag and strip dies. Thank you so much for the chance!!!!! I would love to win because I love to quilt, but the cutting takes so much time. I would choose: the tumbler, Dresden plate, and the 2.5 inch strips! I would like this cutter to simply be able to do more with my sewing. I love to learn new tips and tricks and like to just play around with the fabric and see what I can come up with. I think this is a great tool to help develop more confidence with ones cutting and peicing of particularly curved peices. I would like the Drunkard's Path 7", Dresden Plates and the Hexagon. I love the options one has with fabric, colors and quilting. I think this cutter would give even more opportunities to create wonderful projects. Need a GO to get GOing on the cutting.... So many of us enjoy the quilting, but the cutting leaves us a bit behind -- I'd like to have a GO to get Going!! Stars, Drunkard's path, Wedding ring so many choices!! I'd like to win a GO because accurate cutting is always difficult for me. The three dies I like are the Funky Flowers, the 2 1/2" Strip Cutter, and the Rag Square 5 1/4". I think the ones she would use the most would be the 2 1/2 inch strip die, The 5 inch square and the Rob Peter to Pay Paul dies. Just a great giveaway! I would love the Go cutter because cutting out the fabric is my least favorite part of making a quilt. If I should win, I'd like the 5" square, tumbler, and drunkard's path dies. I want the AccuQuilt GO! Because I'm still learning the finer points of piecing, selecting color and managing to sew the pieces together correctly.... Adding in cutting straight pieces to the aquasion just makes it that much harder. If i were to get the AccuQuilt, I would get the Strip Cutter 2 1/4", The Square 5" (need to cut out more charm pieces!) and The Blazing Star die. I'm with everyone else - who wouldn't want one? I'd enjoy something that made faster work of cutting, as it isn't my favorite part of quilting. And let's see, 3 dies...how about the dresden plate, the drunkard's path, and the 3" half square triangle. Thanks for the giveaway, for sure! I would love to win the AccuQuilt GO! so I could make more quilts in less time. I need to support my habits - quiltaholic, fabricholic and chocaholic. If I could choose 3 dies they would be: GO! drunkard's Path 7" finished, GO! Apple Core 6 1/4" and the GO! Hexagon - 2", 3", 5". Like you, I love working with Hexagons and Curves. Good luck to all. Winning a GO! cutter would be a wonderful way to get my fabrics out of project boxes and onto people's laps, baby! I have a big family and everyone and their brother wants me to make them a quilt. Just imagining cutting out all the pieces for an entire quilt in minutes has me drooling. And the dies I most desire are the 2 1/2" strip die, 3 1/2" square die, and the apple core die. Thanks for the opportunity to win! The reason I want this cutter is because in my old age, I am having problems using a regular ruler and rotary cutter anymore. The dies I'd like are the Tumbler, the 1.5" strip and the chisel dies. My daughter and I will be sharing a GO! Cutter so we will be able to get those pieces cut quickly and accurately so we're able to get right at the sewing. We want more time so sew. It's really simple, the reason to have a GO is for accuracy and speed in cutting! Make more quilts that way. I would want the hexagons, the circles and the 1" strip cutter. 2. It just looks like the kind of wonderful toy I could play with all day. 3. I have never won a giveaway, and this would definitely be a good place to start!! I would like an AccuQuilt GO! cutter because I have two children under 4 and I dont have time to cut and sew. Usually I get to the cutting and never get to the sewing. I also can't cut a straight line nomatter how hard I try. It would save me time and and my life would be less stressful. I would love to win a Go! I am starting to get arthritis in my hands and I am not too good holding the rotary cutter. I would love the 2.5 strip, 6.5 triangle apple core. Thanks for the chance! I'd love a cutter because I'm not very accurate with my rotary cutter! My favourite 3 templates are the: Circle, 2 1/2" strip and 3 1/2" square. Drunkards path, winding way and apple core dies would make these designs so much more fun to work with. I hate cutting these shapes normally but love to use them. Using this cutter would get started, thus finished, much faster! I put off starting a quilt because I don't cutting out all those pieces. I would like the 2 1/2" strip, the 3" half square, and the hexagons. Thanks so much for this giveaway! I would love the GO! because I need help with my cutting accuracy so my quilts turn out more precise. I would like the 2.5" strip die, 5" square die, and one of the single girl/wedding ring dies. First, I want to say thank you for limiting entrants to one comment! It is very discouraging to look at the number of comments on a giveaway and see the number in the thousands. Anyway, the reason that I would love to have the Go cutter is because it would allow me to attempt designs that I would never take the initiative to try otherwise. If I were choosing 3 dies right now, I would choose the double wedding ring (even though it's not available yet) and then I would choose the Hexagon die and the Tumbler die. I would love the cutter because it looks like it will make cutting a lot faster and more accurate! My 3 fav dies are the Hexagons, Double wedding ring and Dresden. I would love to win a Go! With my hectic schedule with the kids, school, work, and my carpal tunnel, I have very limited time to cut AND sew. I specialize in rag quilts and all that clipping really takes a toll on my poor wrist. I would love to have both rag dies and the 6.5" tumbler die. Thanks for this great giveaway opportunity! Thanks for this wonderful chance to win! I would like a Go cutter because I have fibromyalgia, and using the Go would be much easier on my hands. I love the applique critter cutters: butterfly, dragonfly, and bee. I would love to have an accuquilt go cutter to help me make those difficult quilts I would love to try, but do not have time to cut all those pieces out by hand. I would want the GO! Circle-2", 3", 5" ; GO! Hexagon-2", 3", 5"; and GO! Winding Ways. Thanks for a chance to win. I would like to win the giveaway because I can't seem to cut straight no matter how precise I try to be with my measurements. I would choose the Circles, Square 6 1/2, and Rectangle 3 1/2 x 6 1/2. I would love an AccuQuilt Go! cutter. Cutting out is my least favorite task in quilting. The dies I would choose are the 7" drunkard path, double wedding ring, and apple core. I really want a Go cutter to help with my accuracy and to help save on time spent cutting. My least favorite part of the quilting process is cutting and that's why I want this! I like the drunkard's path, double wedding ring and apple core dies. I love to have one becasse I´m so new and slow in quilting, I have too much things in my head to do but no the time, maybe it can help me, don´t you think? The dies i would like to have are: hexagons,6 1/2 squares and the apple core. Thanks for your blog, I eally enjoy it. I have carpal tunnel and when it acts up, forget about cutting!! I love the 2.5" strip cutter, the feathers, and the circles. Even without carpal tunnel I couldn't cut perfect circles!!! Thanks for the chance! I would like to win a GO so my DD can GO. The three dies of choice would be Winding Ways, Chisel and the Diamonds die. I would love a cutter because cutting squares does get tedious! I would like the rag 8 1/2 in square die, the 3 1/2 in square die and instead of being practical I would love the funky flowers to play with. I want an AccuQuilt GO! cutter because I am TERRIBLE at cutting. I can barely cut a straight line. I would like to try more complex quilts and sewing projects, but I am afraid of the cutting! The AccuQuilt GO! would really help! I would get these 3 dies: Rose of Sharon, Circle-2", 3", 5" & Hexagon-2", 3", 5"! I would love the cutter, because with a full time job and full time kids, I have very little time to get into my sewing room. I make quilts mostly for gifts and charities, and have a few on my list I'd love to make if I had the time. The dies I'd love to have are the Winding Ways and Double Wedding Ring, which are both on my want-to-make list, and the funky flowers, because they just look fun! Thanks! I am a simple quilter. But I a have a stash a mile high. I think a Accuquilt Go would be such an incredible tool in helping me cut fabric and make projects for gifts and charity. Because I mostly do simple lines, I think the 2 1/2" strip, the 6 1/2" square and the 4 1/2" triangle would help me the most. Thanks for your input and for being a part of the giveaway. I would love to win an AccuQuilt GO! cutter for the ease of cutting, especially on tricky shapes. I have wanted to make an apple core quilt, but just don't want to mess with cutting the pieces. The three dies that I like the best are: apple core (6 1/4"), Rose of Sharon, and Sunbonnet Sue. Thank you for an exciting giveaway! I would dearly love to have a machine such as this. I am an applique junkie, and as such, spend hours and hours tracing and cutting out, tracing and cutting out......this fabulous machine would save me so much time that I could use for more sewing and quilting!! Of course, I'd have to have the Fall Medley, the Holiday Medley, and the Funky Flowers dies to go with the machine. Here's hoping!! What a great giveaway. Having this cutting system would make that part of quilting so much faster and much more accurate. My fav dies are: half square 4", quarter square 4" and strip cutter 1 1/2". Well I think this would be a great timesaver for me, and maybe save my finger from the rotary. Anyhow, I like the Dresden, Half Square Triangle, and Square. I would love to win an AccuQuilt GO! cutter for the ease in cutting tricky shapes. My favorite three dies are: applecore, rose of sharon and Sunbonnet Sue. first of all i would love to win- you dont even know how much i would love to win a go! now ill tell you why: i am new in the quilting area. i have been sewing for 7 years but i have a true love for quilts but i had only made 2 rag quilts, one little and very ugly quilt and a few diffaren blocks... do you know what i hate the most? cutting! I would love the AccuQuilt cutter because sometimes the cutting of fabric seems overwhelming to me. I think the cutter would motivate me to finish more projects that I have waiting in the wings. I would love the dresden plate die, the apple core, and the 2 and 1/4 strip cutter. I would love to win the cutter for my grandma. She loves to sew & quilt but finds it difficult to cut the fabric. The dies she would most enjoy would be the tumbler, double wedding ring, & 3 1/2" strips. Thanks for the opportunity! Oh my, what a give away. I have been in Accuquilt sites many times, I really want this cutter. It must be nice to do works with so easy cutting. And the first dies I wuold like to have, is 6" sqare, studio heart6 (large) and studio stars1 (large). I would love to win this cutter because I'm not sure if I'd ever try some of these amazing quilts without it. Seriously, I'm not so good at cutting. Me, the ruler and the rotary cutter get along fine, but when it comes to curves and funkiness it's a no go. 3. GO! Tumbler - 6 1/2"
I would love to win this prize. I have 5 inquisitive cats that like to help when I'm using the rotary cutter - no accidents yet, but I'm sure its just a matter of time. I could really make good use of the 8 1/2 inch rag square die and would love to try the larger Drunkards path die. For the final die, the hexagons would be a lot of fun. Thanks for this giveaway! The more I see and read about the Accuquilt, the more I want one! Cutting is my least favourite part of the quilt making process (I am sure I am not alone!) and this would let me get to the sewing part more quickly. The three dies I would get would be the 2.5" strip cutter, 2" square and the 7" Drunkard's Path (so I can try out your tutorial) Thanks! I think the Go would be great for patterns I've wanted to try, but are a pain to cut out, or even impossible to rotary cut. I'd get the Dresden Plate, Rob Peter to Pay Paul, and hexagons. I think I could get a lot more quilts made with a GO! cutter. I would like the winding ways, 2.5 inch and HST dies. I would love the Go! cutter because it would help me make use of my free time. I'm a middle school teacher and am crazy busy with grading and after school activities. This would help my ideas come to life faster! I would start with the Double Wedding Ring, Quarter Square Triangle, and Hexagon dies. yo. I totally want this because it would make prepping for my weekly sewing group a total cinch. I get together with girlfriends once a week to sew. We float around to each other's houses, so when we are NOT meeting at my house, my sewing room is in shambles. there's a lot of dragging stuff out, back and forth, etc. The GO cutter would make prepping a snap! I like to make my own designs and I like to freestyle, I'd want the 2.5" strip cutter and the 1.5" strip cutter. And _of course_ I'd choose the hexagons! I would love to own a GO! Cutter. I want to make a drunkards Path quilt, but I am not doing a good job of cutting with the templates. The GO! would take care of that!! I would like dies...Drunkards Path 7", Square 5" and Funky Flowers for fun. Thank You for the chance. Well, I'd love that Go! cutter because it sure would make things easy and save a lot of time. Not only that, but my rotary cut pieces always seem a little off... The Go! could help my accuracy. As for the dies- I would have to go with the circles, hexagons, and rob peter to pay paul. Thanks! I'd like to have the AccuQuiltGo because it's time saving, and precision in cutting will help with my accuracy in piecing. I would choose the Diamonds 4"x4", the Square 3 1/2" x 3 1/2" and the Triangle-Isosceles 5"x6". I would be interested in the following dies: Go! Triangle 6 1/2", Quarter Square 4" finished triangle and Strip Cutter 2 1/2". I would love one! 3 Dies, I think they would have to be the 2.5 in strips, rag quilt and drunkard path. Plus a few others! Pick Me! I want to win a GO because it will make my work with fabric cutting easier. I have a neck injury that restricts movement in my arms a lot, and with a Accuquilter I could have cut so much material I want. GO! Tumbler, 6 1 / 2 "
GO! Strip Cutter 2 1 / 2 "
I would love to have the Go Cutter. Just need to spend money on other things right now. The traditional dies are what I like. The apple core, winding ways, and rob peter to pay paul are my favs. hexagon - 2", 3", 5"
I would like to win the GO! cutter because my mom lost her mom at a young age and all she talks about is the double wedding ring quilt that was on her mom's bed when she was 8. I would love to make my mom a double wedding ring quilt (but the cutting would take FOREVER!). That is one of the dies I would like along with the rag quilt and 2.5 strip die. GOOD LUCK TO EVERYONE! I would like a Go Cutter because I think it would help me be more productive in my quilting. I'd be able to cut faster and more accurately hence more completed quilts. I'd pick the hexie, the circle, and the 2 1/2" strip dies. I would LOVE to win a GO ! The GO! is portable , this way I can pack it up and GO! to my mom's to share with her. The speed and accuracy of cutting of the fabrics will be sooo much easier on the hands and wrists. The dies I would LOVE to win win be the 3'1/2" Strip Cutter, the 5 1/4" Rag Square, and the 4"x4" Diamonds. Thanx for the opportunity to win a GO ! Thank you for hosting a great give-away! I love gadgets...any and all kinds to keep the juices flowing and learning new ways of doing things is always wonderful. I don't mind rotary cutting, but I really take my time, so often the process is s-l-o-w.
My die choices: strip cutter 2 1/4",stars, and critters. I would like the AccuQuilt Go! Cutter because I am new to quilting. Now that I have caught the fever, I would love to make some of the more complicated designs as gifts. My best friend is getting married, and I really want to make her a double wedding ring quilt. I would pick the double wedding ring, winding ways, and the square (4 3/4") dies. Thanks for the giveaway! What a thrill it would be to win a Go Cutter. I would share it with my two quilting buddies who come to my house once a month to quilt til we wilt. Thanks for the chance to win. I wish I could think of something funny and memorable to say....If I was lucky enough to win I would choose The Sunbonnet Sue and Overall Sam. I have 6 grandchildren under the age of 5 and want to make one of these for each child. I would also choose the Double Wedding Ring. I'd love to win a Go! Because I wan to make some of the more complicated quilts but don't have the patience to cut out all those pieces! (Yes, I am one of those who stand by the microwave urging it to hurry up! :)) I think with the Go! I would be able to cut all the pieces at once and be done with it! The three die I would like are the Hexagon (3 sizes, 2" 3" and 5") the double wedding ring and the drunkards path. I love the quilt you did with the drunkards path! I would love a GO! because I work long long hours and only have time to quilt on the weekends. Having the GO! would speed up the process and would make getting to the quilting part much faster! Quilting is my sanity and this looks like a perfect product that I would constantly use. I want a Go! because I have two kids and a dog that don't leave me a whole lot of time for sewing. It would be SO great to simplify my cutting! I'd like the Hexagon, Tumbler and 4" half square triangle dies. I would love an AccuQuilt Go because I have a very hard time accurately cutting curved pieces. The 3 dies I would like most are drunkards path 7", double wedding ring and feathers. It takes me so long to cut out my fabric. I usually have to cut out my stuff the night before I sew. Having the cutter would be such a blessing. The dies I would choose are the 2 1/2 inch strip, The funky flowers, the circles. I would like the 7" drunkards path, hexagon, and the circle dies. As much as I love making quilts I hate the prep work of cutting. The AccuQuilt Go Cutter would be the answer to my problem. I really like the round flower die, any half square triangle cutter and the hexigon. Thanks for the opportunity. I would love to have a Go cutter to allow me to experiment more which would allow me to donate those experiments. I think that the 2-1/2" strip, the tumbler and the 2-1/2" triangles would be a great start. I have been lusting after the Go! for quite some time I dream of the day that I can cut fabric patches without the ruler just slipping that little bit at the end. I could also hide my rotary cutters when my toddler comes into the room while I'm cutting. The dies I dream about are: drunkards path, double wedding ring & 2.5" strip cutter. I would love a Go! to help the cutting go a little faster. I am a mom to 2 girls 4 and 1 year old. My husband is a civilian working a Camp Liberty in Baghdad. I get to do any sewing, cutting, quilting, ect. after they go to bed at night. Which gives me 9pm to midnight. I would love a Go! The dies I would like are either of the Drunkards Path, the Double Wedding Ring, and Tumbler. If someon at AccuCut is reading I would love to see a 6" circle come out too. I would love to have an accuquilt cutting machine because I love to quilt. I am finding myself a little low on time and think that this would really help move the process along. On lady in our quilt guild has one and is willing to rent it out, but that just won't work for someone low on time. I would be able to cut on my own time and life would be simplified! I think I would like the drunkard's path 7", the sun bonnet sue, and the winding ways. I'd love to win a GO cutter simply because I absolutely hate to cut fabric. And honestly? I'm not that good at it! The three dies I'd like are the 2.5" strip, the Dresden plate and the 6.5" square. I would love to win this because with an active 18 month old, it's hard to find the time to sit down and quilt! With this, I'm hoping to spend more time quilting/piecing and less time cutting! I would love the Drunkard's Path, Hexagons, and Double Wedding Rings dies! Thanks so much for the giveaway! I have been eyeing the AccuQuilt Go for months now. I am loving the idea of trying something new and am so ready to give the Go a chance. I would love to make a few quilts that are out of my normal for my daughter and this is the perfect opprotunity to make that happen. My first three loves to work with would be, Holiday Medley, 7" Drukards Path and lastly 5 1/4 Rag Square that I plane to make baby quilts and donate them to the hospital where I had my daughter two years ago. Thanks for the chance, have a great holiday weekend. i think the three I would choose would be the circle, the winding ways and the drunkards path! I would love to have a Go to take to my guild's community sew days. The quilts we make could be cut out so much faster and more accurately. I would love the chisel die, the new Sunbonnet Sue die, and the Drunkard's Path die.